We moved to Beacon Hill in 2003. Java Love was just transitioning to Baja Bistro, La Cabana still served up friendly, cheesy Tex-Mex, and Perry Ko’s was just about to be torn down to begin construction on the Light Rail Station. There was a lot going on in our neighborhood, but there wasn’t anywhere to go for a “craft beer”–that required a trip to Georgetown, downtown, or (maybe) Columbia City. That’s changed–completely. I can’t believe I stopped updating this blog before the bar boom began on Beacon Hill. We now have more places than I can count for enjoying a beer and some snacks. The Station (and The Station Wine Bar) Tippe and Drague, Perhelion, Oak, Bar del Corso, El Quetzal…I’m forgetting someone. My review of the Jefferson Golf Course Clubhouse is now way out of date–it’s been demolished and replaced with fancy. There’s a lot of that going on around Seattle these days–demolition and development. Beacon Hill has changed a lot. New buildings, new people, new infrastructure. It’s confusing and exciting and scary. I’ve watched these changes (and been part of advocating for & against some of them) as I’ve watched my daughter grow. For the most part, I’m happy to welcome new neighbors and visit new restaurants. I’m sad that Monti’s closed, but I’ll check out “the new place” (Clock-Out Lounge). I miss the neighbors who moved out, but I’ll go say hi to the new folks down the block. I love being able to choose between hipster bars to enjoy the best IPA & fries. Every single one of the places I’ve listed is owned & operated by neighbors–people who live in Beacon Hill. Most of the employees also live in our neighborhood. The bars & restaurants reflect the diversity of my changing neighborhood, including me. I’m happy to bring my kid in and enjoy popcorn, a cheese plate, and a locally brewed sour ale at Tippe & Drague. If they’re busy, we can hit up Oak for a cupcake and some killer fried chicken. Or maybe we’re in the mood for the best mole in Seattle…and maybe the lady who makes it is working today at El Quetzal. Change is hard, and we need to be thoughtful and aware of the impact of development in our communities. So far, the change that has happened in Beacon Hill has only made happy hour better. I got wet, Mama!, a photo by melissajonas on Flickr. Before the kid, Georgetown was our go-to destination. There are a handful of very good bars on Airport Way. Unpretentious, reasonably priced, good food, excellent beer and lots of pinball. Also, alas, almost all 21+ only. Don’t despair, parents. G-Town has plenty to offer for those of us dining & playing with ankle biters. Sylvia’s Friday routine (in this order, always): Circus School, sushi, playground and the beer store for a be-bop. Circus School is SANCA. Amazing instructors, classes for all ages. The Cutting Board is delicious and very reasonably priced. Lots of veggie options, too. They welcome kids & even have small plastic cups & child-sized chopsticks. Bonus for the digger-obsessed: there’s a HUGE construction project underway–lots to watch. 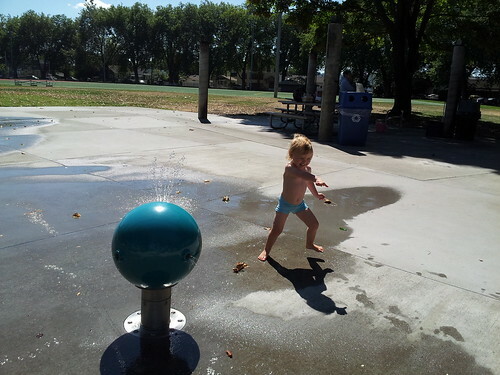 Georgetown Playground is one of the few SE Seattle playgrounds with a spray park AND mature trees. Georgetown Brewery fills growlers fast & cheaply and will give your kid a lollipop if you ask. Other places where kids are allowed in Georgetown: Calamity Jane’s, Stellar Pizza (aka Stella’s), Dog’s Dream pet supplies, and Full Throttle Bottles. We occasionally visit Fantagraphics and the coffee shop (salted dark chocolate covered graham crackers–yow!). I haven’t tried the newer diner. Geraldine’s is a default destination for breakfast/brunch for the parenting crowd in SE Seattle. I enjoy the bright colors & comfort food at Geraldine’s, but even before we had a kid I couldn’t handle waiting in line. Now it’s not an option; if there’s not a table available when we arrive, we find somewhere else to go. What many parents don’t realize is that Lottie’s Lounge–right across the street–also allows minors. Brunch is good and generally not nearly as crowded. The staff are welcoming and the stage space is perfect for playing with cars or coloring at the table. Bloody Mary Brunch features 6 Bloody Marys and 6 takes on the Mimosa. Good stuff. I usually prefer to make my own brunch because I can eat in my pajamas and let the kid run around in the backyard. When I go out, it’s for early dinner (aka Happy Hour). This is where Lottie’s really shines. Specialty cocktails that change seasonally and good beers on tap. Good food to nibble while you enjoy your drink(s). Ingredients are locally sourced, fresh, and often organic. Lottie’s happy hour runs from 2-6pm daily. If you’re out with a non-foodie kid (and/or you really like dairy), they have a heavenly mac & cheese, cheese bread and/or grilled cheese sandwich. The hummus plate is a dependable choice and all their sandwiches are good. Plan ahead: there isn’t a changing table or flat surface for changing diapers. Bring a cushy blanket (or use your jacket) and use the floor if you must. Take stinky diapers home with you. It’s not a big space, so if there’s any kind of crowd please fold your stroller & stash it. Lottie’s is a lounge–understand that while kids are allowed outside the bar proper, it’s not aimed at families. It’s a watering hole. As always, please tip generously, keep your child contained & entertained and–for the love of all that’s holy–clean up after your kid. I’m going to say it again: tip generously. Before or after your Lottie’s treat, explore the rest of the area. There’s a lot to love in Columbia City: nice library, cute toy store, outstanding kid’s consignment shop and a fantastic farmer’s market. The Seattle Gymnastics Academy has a variety of ways to tire your kid out. Avoid driving if you can, because parking is tough. It’s a pleasant walk from the light rail station to the business district (especially in nice weather). Columbia City boasts at least a dozen very good restaurants and a growing number of venues to see live music. Good times for all ages. Happy Nap Hour!, a photo by melissajonas on Flickr. 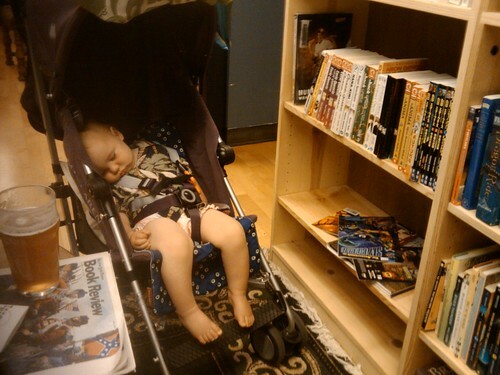 Best of all worlds: sleeping baby, beer, books. Inner Chapters was fantastic. I wish the owner all the best with her new baby. Thanks for the great times! Cafe Flora is my new (rediscovered) favorite place. High chairs/booster seats: More than I’ve ever seen in one place. Happy hour: oh yeah. One of my favorites. 3-6pm, good prices on great selection of small plates, plus drink specials. Activities & safety issues: Good selection of toys and crayons. Kid books for sale. The fountain is both entertaining and potentially dangerous. Near the arboretum and Birth & Beyond. Food/drink (for kids and adults): Great vegetarian food and incredible cocktails. Transit access and/or parking: 2 lots, one about a block away. Street parking if you’re patient. I’m not a fan of transit to Madison Valley, but there are buses. Accessibility for strollers & little legs: Please leave the stroller outside. Walkable for toddlers & bigger kids. Restrooms and changing table: Comfy inflatable changing table, step stool for washing little hands. Overall welcome (or not) towards kids & babies: Unbelievably friendly. Not just tolerant, but welcoming and engaged. We live just about a mile from Jefferson Park. Baby fell asleep walking over there yesterday, en route, so we stopped off at Victrola for coffee–yum! When we arrived at the park, she was still asleep, so we strolled around the park and watched the big kids tumble down the slide. Still asleep…what to do? After a brief debate about why we’ve never gone there, we decided to check out the Jefferson Park Golf Course snack bar. Cue celestial singing–they have NFL Sunday Ticket! And beer! And fried things! Children are allowed! This is exactly what this Beacon Hill family needs. Baby gets to enjoy the park, mom and dad get to unwind with a frosty cold one. Becoming a parent shouldn’t mean giving up the things you love. I love football and beer. Baby loves happy parents. We took advantage of the incredible sunny weather today and went on an Orca adventure. Light rail to University St. Station ($1.75), then a short walk to the ferry terminal. I didn’t have a plan, I just knew I wanted to get on a boat in the sunshine! Choices at the terminal include Argosy Cruises, WA State Ferries (Bainbridge, Bremerton, and Vashon) and the King County Water Taxi (aka West Seattle Water Taxi). I’d like to take a day trip to Bainbridge, but I need more information about what’s accessible without a car. 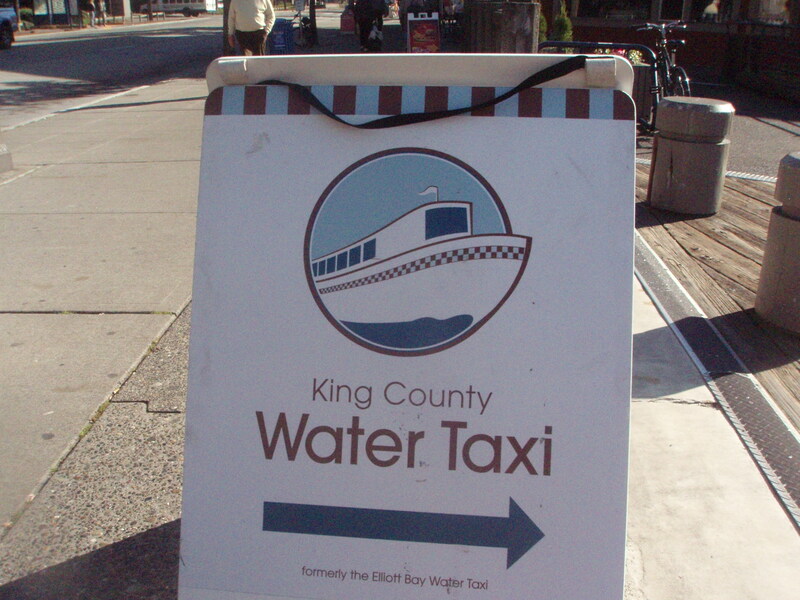 The Water Taxi goes between downtown Seattle and Seacrest Park in West Seattle. It’s only $3.50 ($3.00 with an Orca, kids under 5 ride free) and a 10 minute ride. It’s currently operated by Argosy, so look for their signs. It was a pleasant ride, especially nice on the upper deck. There’s a small snack bar–helpful if you’re hungry and also a good way to break larger bills. The Water Taxi requires exact change. I used my Orca card, which was much more convenient than digging for change–plus I saved $.50!. Once we were in West Seattle, I ordered some delicious fish and chips from Alki Crab & Fish Co. If I had done my research, I probably would have asked for the order to go and hopped back on the ferry. In the future when traveling alone with baby, I’ll jump back on. If I’m with a friend and it’s happy hour, I’ll hit the deck for something yummy–the drinks menu looks good. Excellent fish and chips, reasonably priced, great view. Very friendly staff and every customer cooed over the baby. Note: there is no changing table and the restroom is an unheated park restroom. I changed the baby on the grass in the sun, but on a rainy day you’ll be limited to a wet concrete floor or inside the restaurant. Not good choices. Mimi Smartypants Funny, smart, excellent writer. 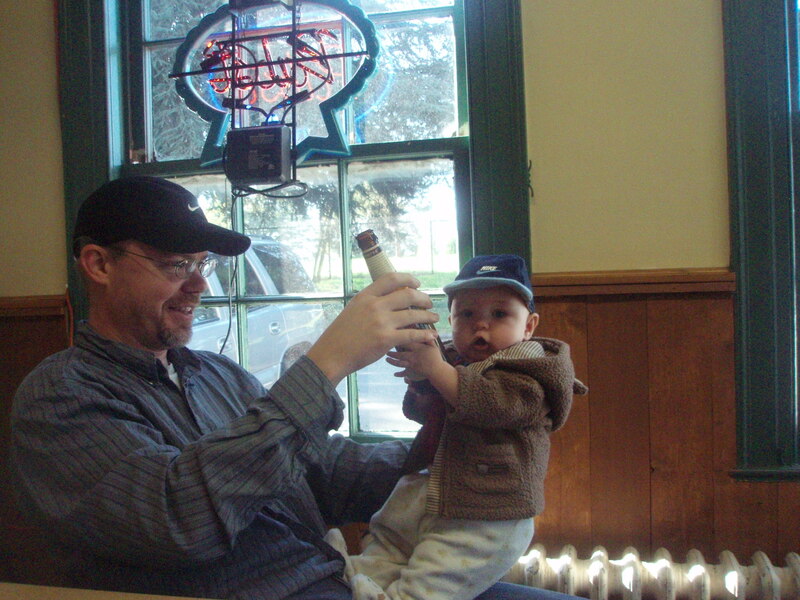 Machine House Brewery Holy grail of drinking with kids: open space, dog-friendly, bring your own food. Bonus: very good beer! The Station Locally owned & operated coffee shop on Beacon Hill. Beautiful people passionate about our community.